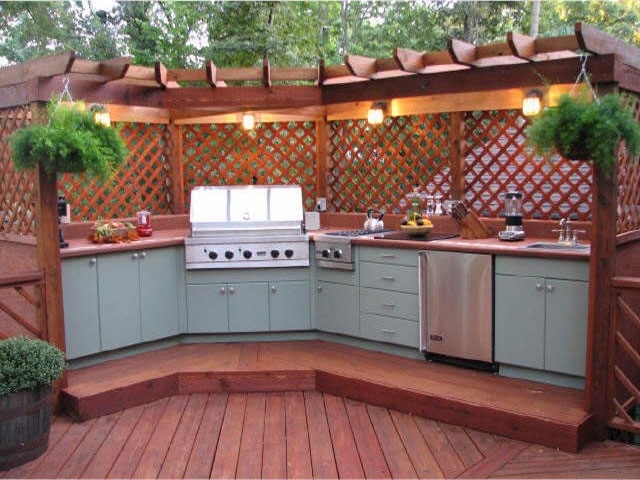 Wondering of ways how to make your outdoor kitchen look extra special without a complete overhaul? Consider these 4 awesome features for your outdoor kitchen that’ll make you and your guests love it even more! Instead of having your usual bar stools or a long bench, why not install something playful like a swing seat? Let your family and friends have fun, literally, by reliving one straight out of their childhood. Attach your swing seats from a sturdy beam of your patio cover or pergola and amaze anyone who comes around with your truly unique swing seat. It’s so nice to chill with a cool drink in hand while savoring the summer nights ahead. But what’s nicer is easily getting to your stock of chilled drinks courtesy of a built-in ice bar on your outdoor countertop. This outdoor kitchen feature is especially helpful when you simply love entertaining and having your friends. Okay, we did not mean it really goes away to clear space after you’re done using it. A simple roll-up door, a sliding one or even a garage door that also acts like an awning is a great feature to protect your outdoor kitchen from harmful weather elements. This door feature also makes sure your kitchen ingredients are safe from scavenging animals out on the prowl at night. If space is scarce for your outdoor kitchen, consider having foldable tables and chairs instead of mainstay patio furniture. You can either have those which you simply fold up or those more ingenious built-in the wall type.